Package included: 2 pcs Wine Glass Holder (Include 3 pcs screws). 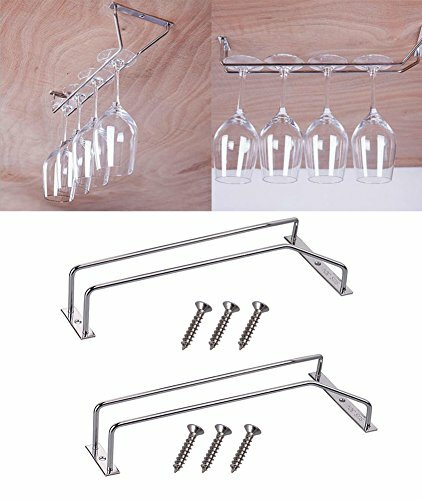 2 Pcs single rail stemware rack, wine glass holder. Installation is a breeze with the included screws and anchors. Fits under most cabinets. With durable construction, the rack is easy to clean and will last a lifetime. It looks great and keeps your stemware ready to go for your next impromptu gathering. For a single person this is great for an apartment, easy to install just a few screws. Easy installation with the included screws and anchors(mounting 3 screws included). Durable, the rack is easy to clean and will last a lifetime. Dimensions: 28cm long, capable to install side by side to hold more stemware. If you have any questions about this product by NUOMI, contact us by completing and submitting the form below. If you are looking for a specif part number, please include it with your message.